The coached sessions will be led by Barry and Phil Jameson from Tri4u and Neil Bowers from mvsport, experienced Open Water Swim Coaches. Full safety canoe cover and lifeguards will attend all sessions. 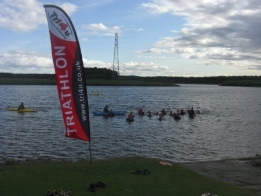 The sessions are designed for swimmers seeking to gain confidence and learn new skills for Open Water swim events, swimming or Triathlons. Everyone who registers will receive a swim information pack. There are 2 session times to allow us to divide the swimmers to ensure a good coach to swimmer ratio. Both sessions will cover the same objectives and there will be 2 groups of ability/experience in each session lead by a coach. Places are limited so it is advisable to book as soon as possible by emailing Barry or Phil using the details below.